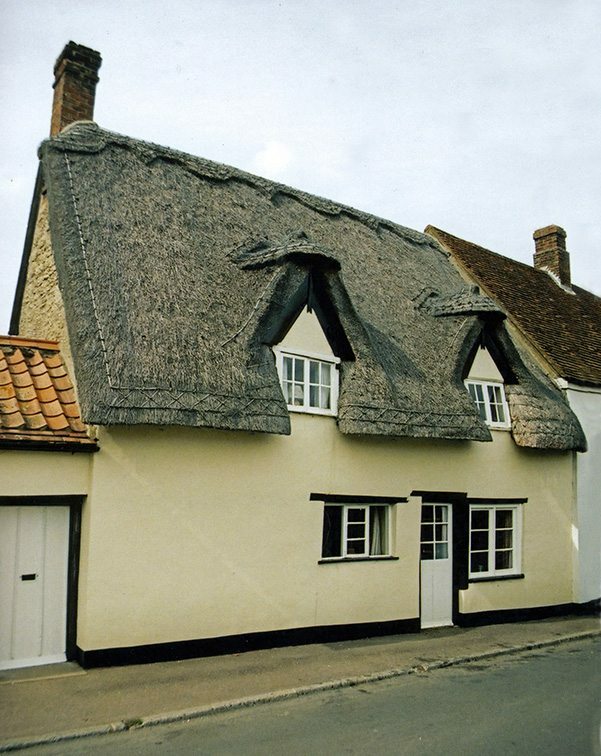 Although these two counties lie at the western edge, of the Eastern tradition of thatching; both shires follow this style closely. Long straw was the dominant material in both counties, until recently, with many examples still remaining; especially in Hertfordshire. Even when combed wheat reed is used, it’s usually finished in a long straw manner. 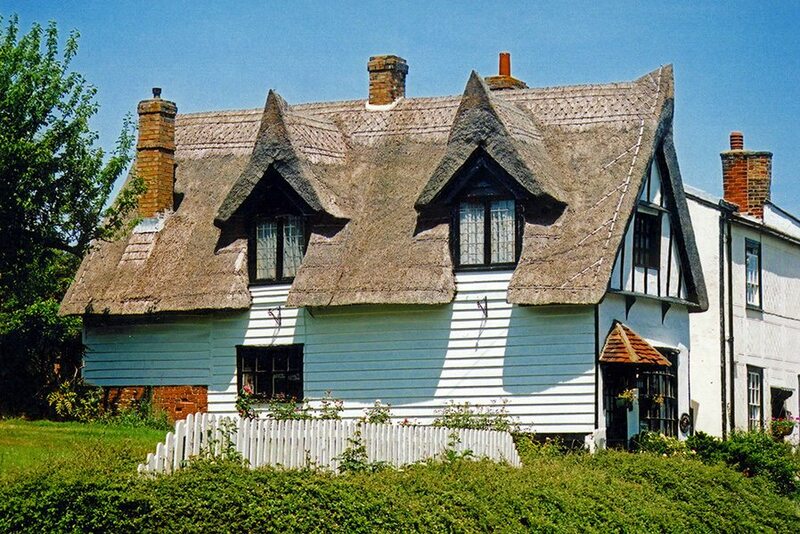 Bedfordshire seems to be the home of a great deal of ‘picturesque’ thatch. 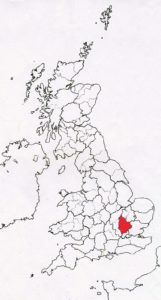 Being found on properties built in the ‘Cottage Orne’ style… It appears many large country estates housed their tenants thus, in this county. Even their religious needs could be attractively catered for, in the splendid chapel at Roxton. Roxton Congregational Chapel… Which started life as a barn. 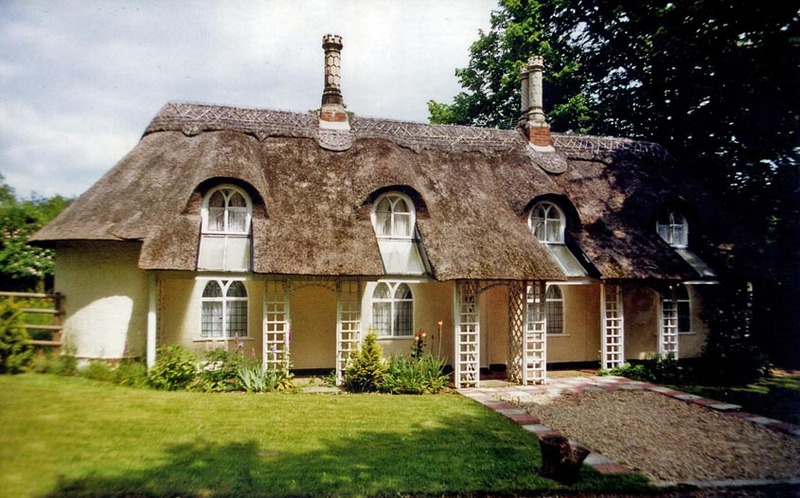 Being converted, in the early nineteenth century; in the fashionable ‘Cottage Orne ‘style.. Below are two further examples of this design, at Old Warden., many converted buildings, being based on earlier existing cottages…. 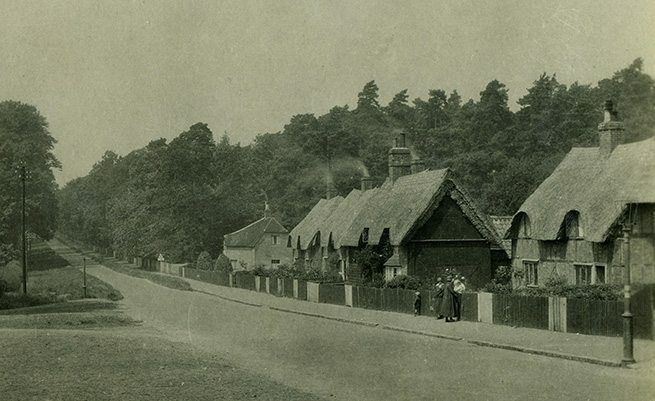 The above cottages are still a landmark, in Ampthill. 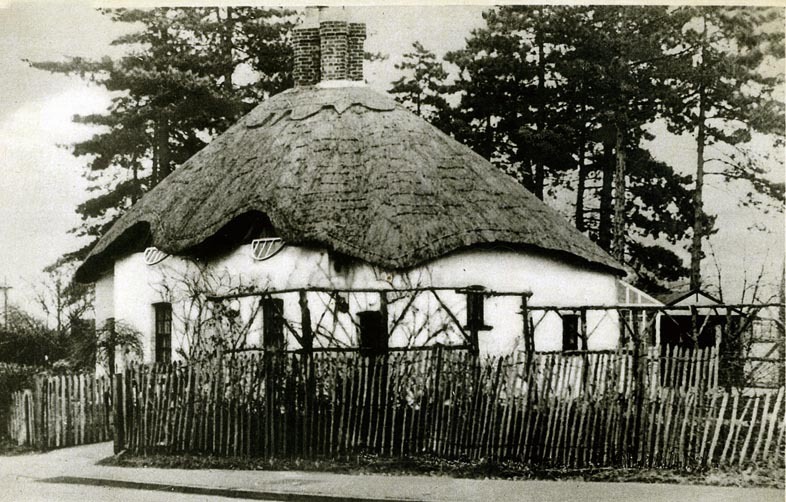 Being yet another group of ‘Cottage Orne’ dwellings, dating from around 1815 and must be just over a century old, when captured here. Shown are thick, multilayered long straw roofs. 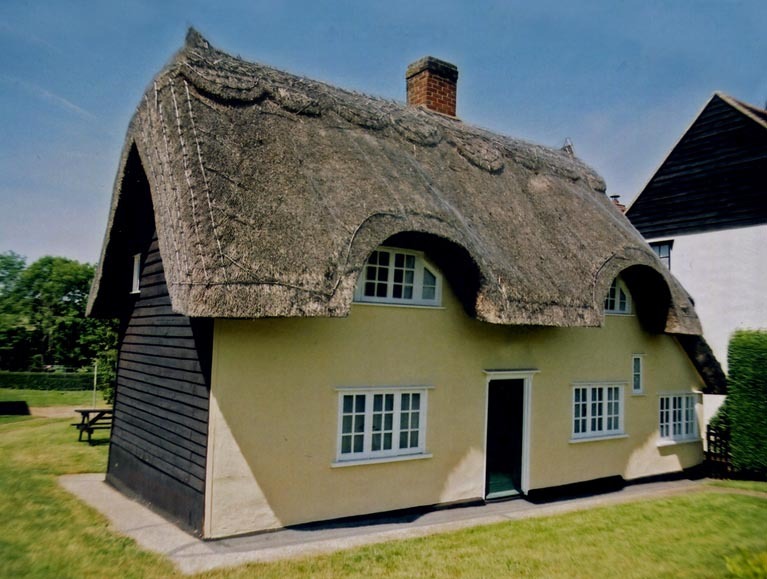 Not so the modern thatch, as these mock Tudor cottages, are now covered with combed wheat reed. 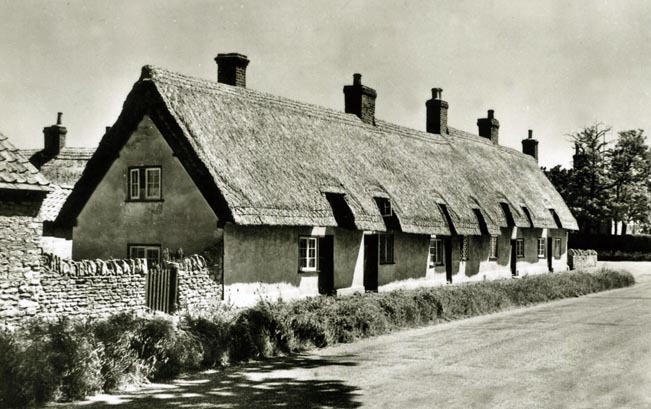 Bedfordshire thatch…Above is a row of angular, long straw cottages, at Biddenham, in around 1930. 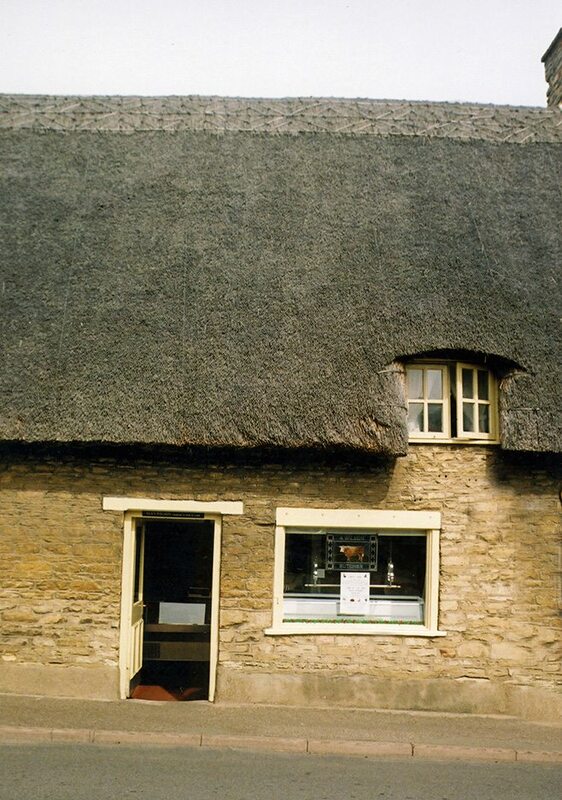 The right hand, understated butcher’s shop, is at Sharnbrook… As is the long straw, thatched cottage below, which has a similar roof, to those in 1920’s Ampthill. 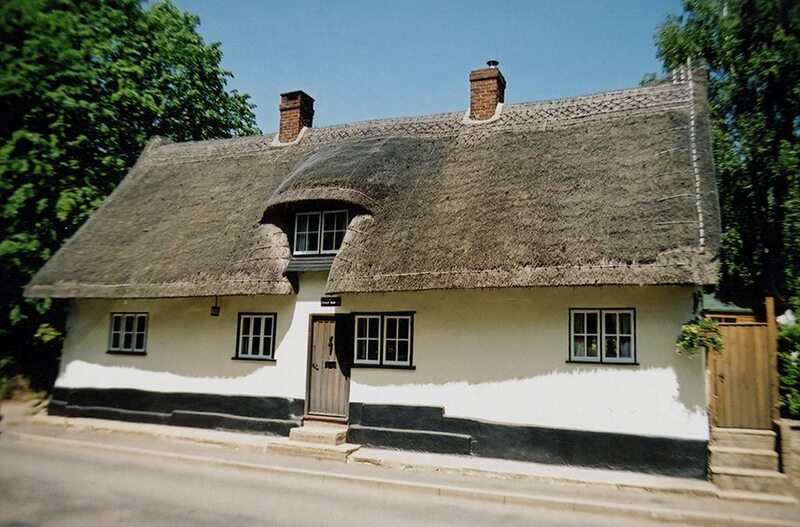 But this thatch’s thick underlayers are neatly covered over, on the gable ends. 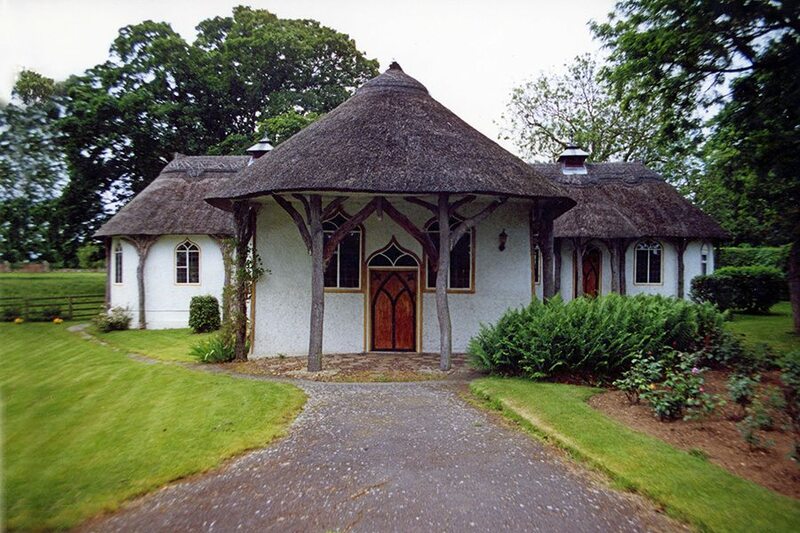 Single storey… Both the above cottages, started life in the seventeenth century, as single storey dwellings. 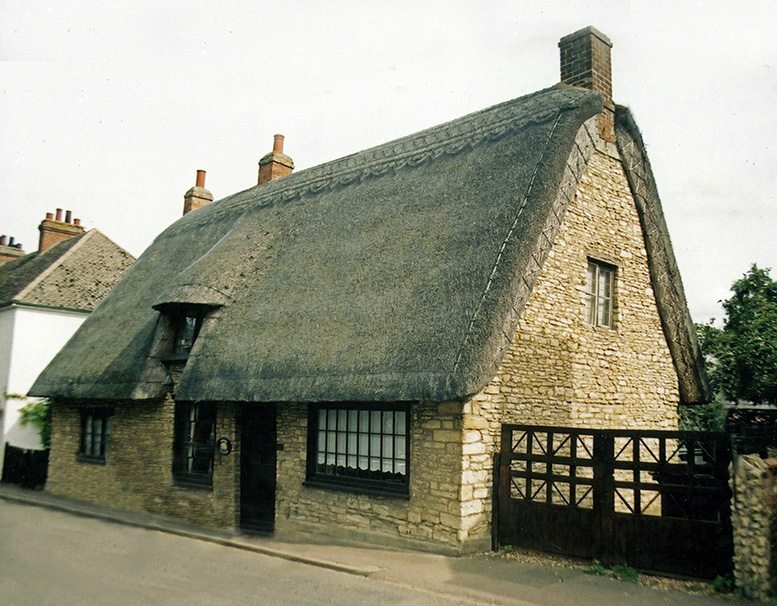 The lower, long straw thatch, at Stevington, shows the angular Eastern style well. 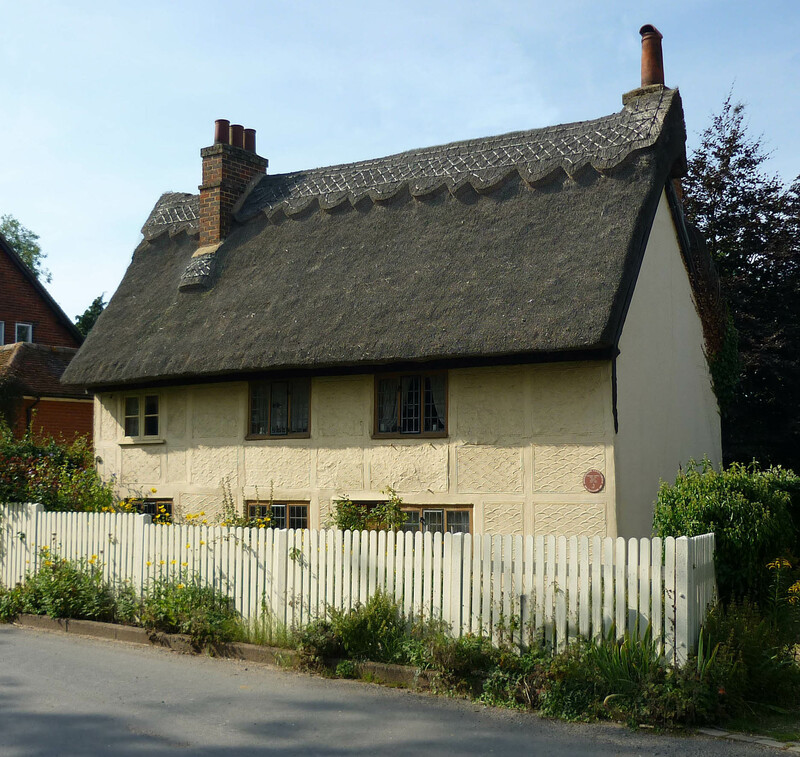 Sharply cut ends… Some angular Eastern thatch, above, at Little Hadham. Where a new flush ridge, protects a long straw roof. 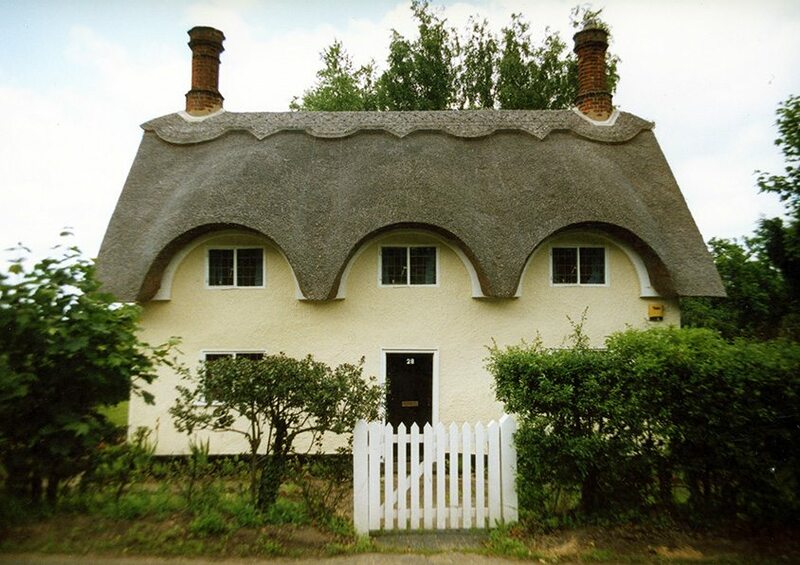 Both ridge and coatwork are fairly new, on the lower roof, at Great Hormead. 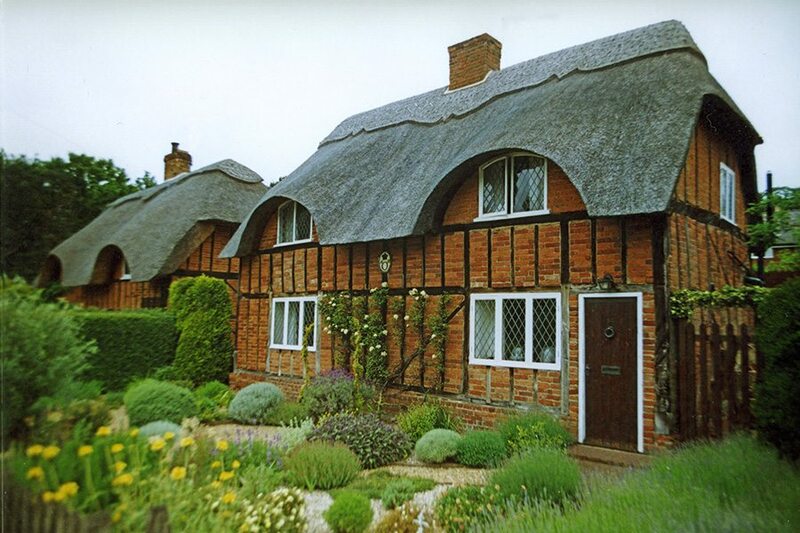 Both roofs showing what type of ridging was used, in this county, before the invasion of the ornate, cut block varieties…. Still extant…a long low dwelling at Batford Mills, near the River Lea, around 1900. 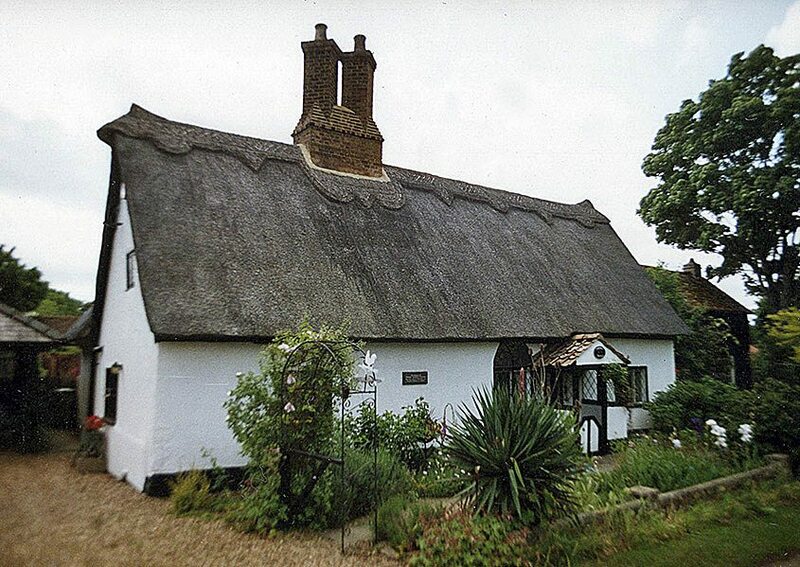 Although altered this cottage still has it’s thatch. 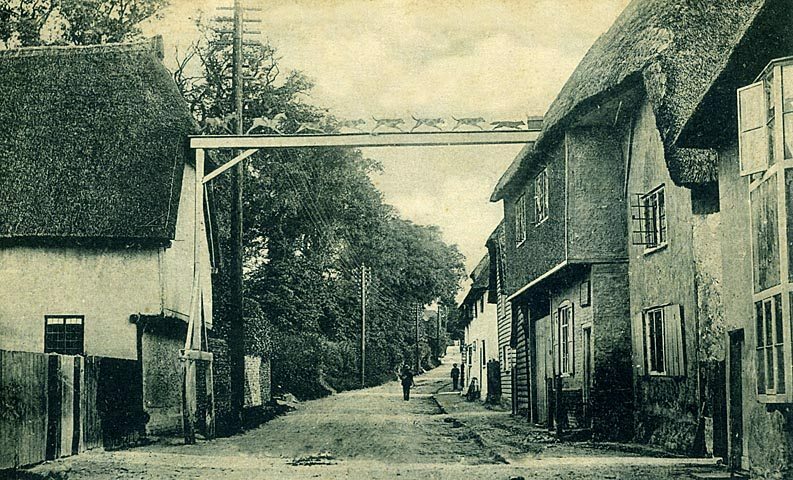 The grocer’s shop… Eric Blair, the author ‘George Orwell‘, spent some happy years dwelling in the tiny Hertfordshire village of Wallington, in the late 1930’s. 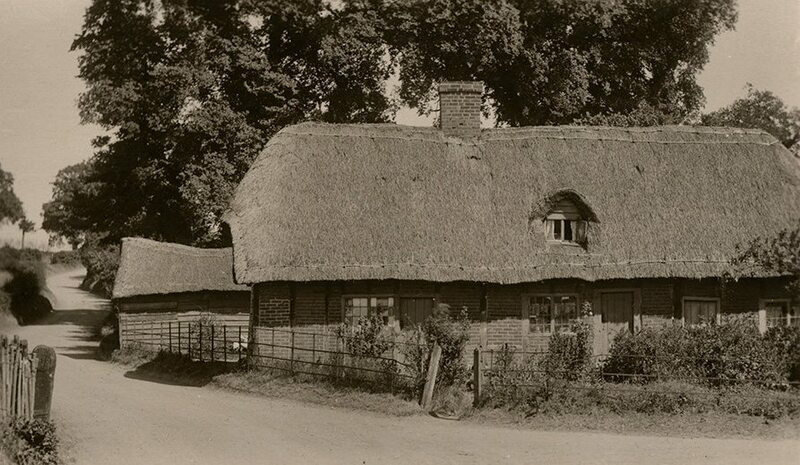 Here he ran a grocery shop, from this thatched cottage. Moving here in 1936, he wrote ’The Road to Wigan Pier’ and married his partner Eilen, in the local church. 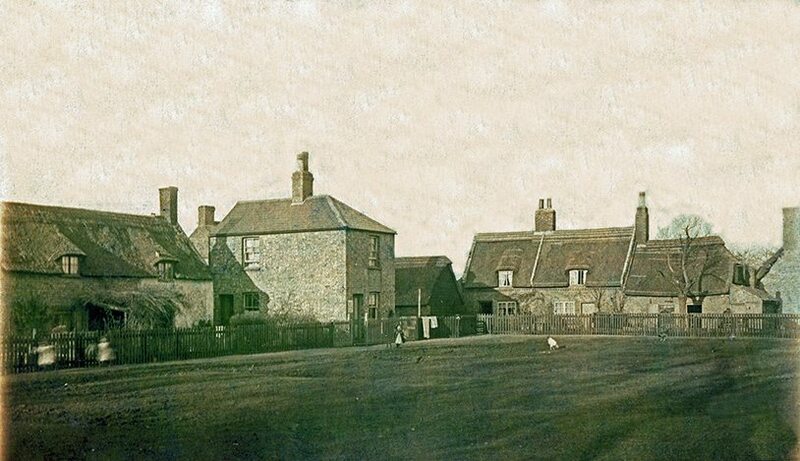 After serving in the Spanish civil war, the author and his wife returned here in 1937, when he wrote ‘Homage to Catalonia’… This hamlet was almost certainly the basis, for the fictional village of ‘Willingdon’; where the famous ‘Animal Farm’ was situated… photo: copyright & thanks to Julian Osley, Creative Commons.